The English language (and the Latin alphabet it uses) is well-known for adapting itself with the times and the needs of the many different people who use it. Because the language and the writing system have changed so much already, someone or another regularly comes along with a new pitch for yet another change. But is it a great idea or just a gimmick to propose something new when we’ve already got the building blocks? Recently Paul Mathis, an Australian restaurateur, has decided to “improve efficiency” by shortening the word “the” to a letter “Ћ”* which is designed to look like a combination of the letters “T” and “h”. Mathis seems baffled that “and” can be abbreviated with an ampersand while being only the 5th most commonly used word in English, while the most commonly used word still requires THREE WHOLE LETTERS! His pitch is that his new character could save valuable strokes of the pen or valuable characters in a tweet. Maybe so, but is his the right solution? Although he proposes this as a new shape, in fact just writing about it requires an existing solution (and probably not the best): the Cyrillic capital letter “Tshe”, used for Serbian. ** If you look at Ћ in just about any typeface, though, you can see that it’s already got better proportions than just a T and an h crammed together. What troubles me the most, though, is that saying Ћ can replace “The” would be awkward for people who already know the Cyrillic alphabet and the sounds its letters can make. Besides, the Latin alphabet already has a Unicode-ready single character that makes the right sound, and it comes in both upper- and lowercase: the thorn! Used mostly in Icelandic today, Þ and þ are used for the “th” sound of “the”. 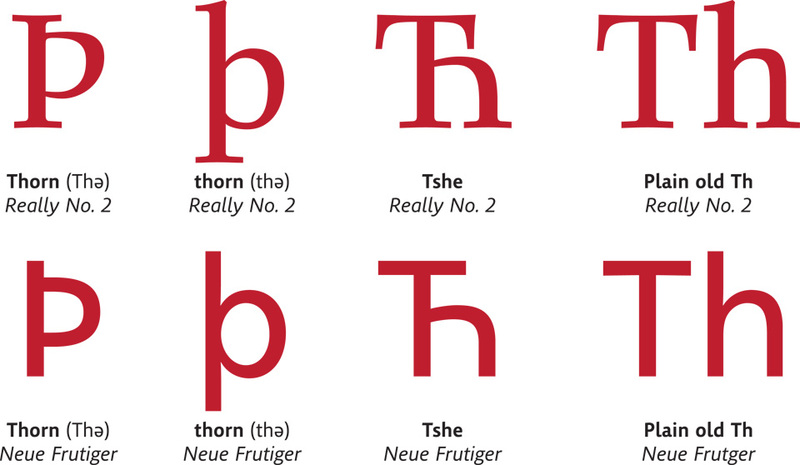 The eth (Ð and ð) might work a little better linguistically, but thorn also has history on its side. That quaint “Ye Olde” tavern you like? That comes from an older way of writing thorn that looked more like a “y”. These gimmicks occasionally gain some ground, though. Martin Speckter invented the interrobang — ‽ — in 1962 and it finally made its way into the Unicode standard, although you’d be hard-pressed to find it in general use. You may also have seen talk of the SarcMark - which someone suggested could be used to denote sarcasm to avoid any awkward misinterpretations during text or email conversations - however that idea didn’t really take off either. The ampersand grew out of writing convention, and eventually took on a slightly subtler meaning than just any instance of “and”. That kind of evolution is how these concepts take root. Mathis’s gimmick is more of a limp stab at a revolution, and probably one we should dismiss. Þ end. ** This article highlights the fact that I'm not using fonts that support Cyrillic characters like Ћ properly. Sorry about that. ** This sentence was removed from the post before it was published, which is a little silly since the next sentence doesn't quite make sense without it. Enjoy the restored flow of thought!